LOS ANGELES — The reopening of Yosemite National Park can’t come soon enough for Douglas Shaw. 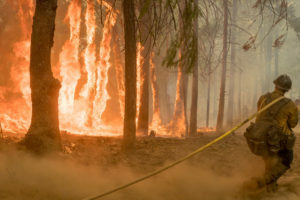 The nearly three-week closure was the result of a wildfire that has burned 150 square miles (389 square kilometers) and killed two firefighters since it started July 13. Though the blaze didn’t reach the heart of Yosemite Valley, it burned in remote areas of the park and choked popular areas with smoke. Shaw is among hundreds of business owners in small communities surrounding Yosemite who depend on tourist dollars. Tens of thousands of visitors from across the globe canceled trips because of the park’s closure, which began July 25. The Ferguson Fire is one of several devastating blazes in California that have killed at least a dozen people — the latest being a firefighter from Utah who died Monday while battling the largest fire in recorded state history north of San Francisco. Yosemite is not the only national park struggling with wildfires. Shaw said his hotel probably won’t be more than 45 percent booked this week, when normally it’s sold out well in advance. There were just 10 people staying there Monday night, he said. Tom Lambert, who rents out an apartment within the park, said he and his wife have lost about $20,000 in income because of the closure. And because the apartment is along the one entrance to Yosemite Valley that will remain closed for at least a week, he said his next booking isn’t until Aug. 31. As for the park, the dent in visitor fees will impact park improvements, such as fixing roads and updating facilities, ranger Scott Gediman said. It’s not the only national park struggling with wildfires. In Yosemite, visitors likely will notice some smoke and may even see flames on their way in, though the fire is almost entirely contained, Gediman said.